After School, students either go to university for 4 years or join the army for 2 years. Many choose the latter because it's easier. Education is for half a day unless the parents pay more (as some working parents do, in Hanoi). The hours are 7 to 11.30 or 1 to 4.30 – 6 days (not Sunday). Children work on the farms the rest of the time. The cost is $400 per student per annum in Hanoi. 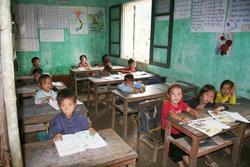 The Ethnic Villagers are subsidised and pay $4 per year but still many of the villagers don’t go to school. The Government together with the Japanese funding is building lots of local schools and they are all a similar design of yellowish exterior.